We've never paid much attention to Morocco. To us, it was a place to walk through between France and Japan, on our way to something cool to drink at the American Pavilion. 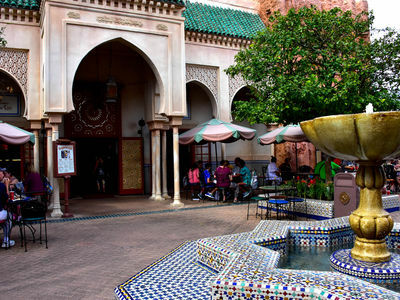 Then one day we couldn't get dinner reservations for a Candlelight Processional anywhere else at Epcot except the Restaurant Marrakesh, and our whole perception about Morocco changed. 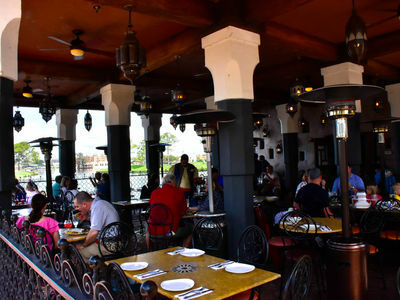 The food at Restaurant Marrakesh was outstanding, and we'll talk a little more about that later. What we found as we turned into the Morocco pavilion and headed past the archway was a labyrinth of alleyways with shops, eats, and architectural design that made us feel like we were really there. 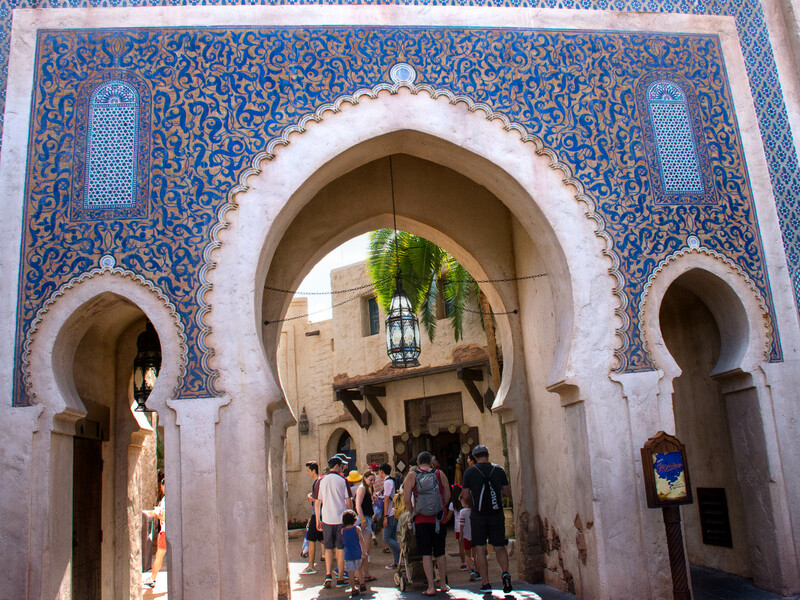 All the pavilions at World Showcase are very well done in terms of architectural authenticity, but Morocco, to us, is over the top. 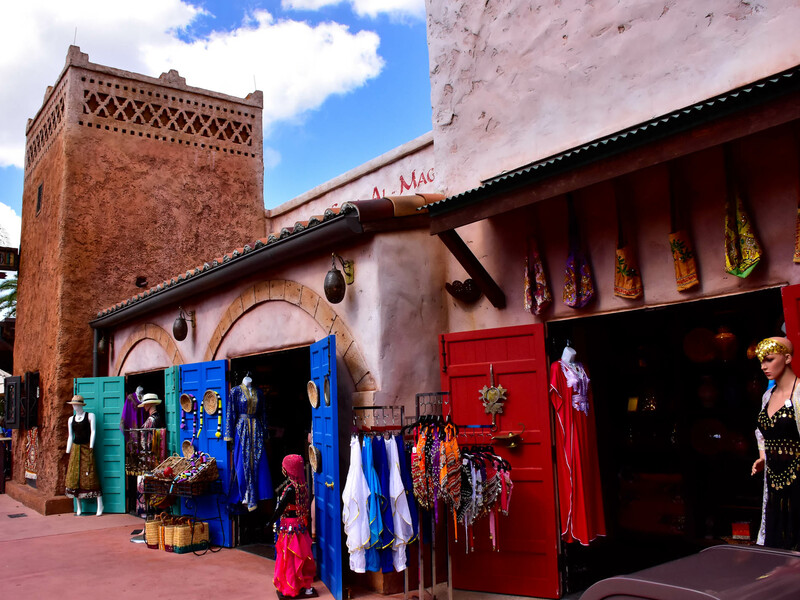 Our research tells us that more native artisans worked on the initial construction of Morocco than any other country in World Showcase, and it shows. Merchandise here is a cut above other pavilions too. 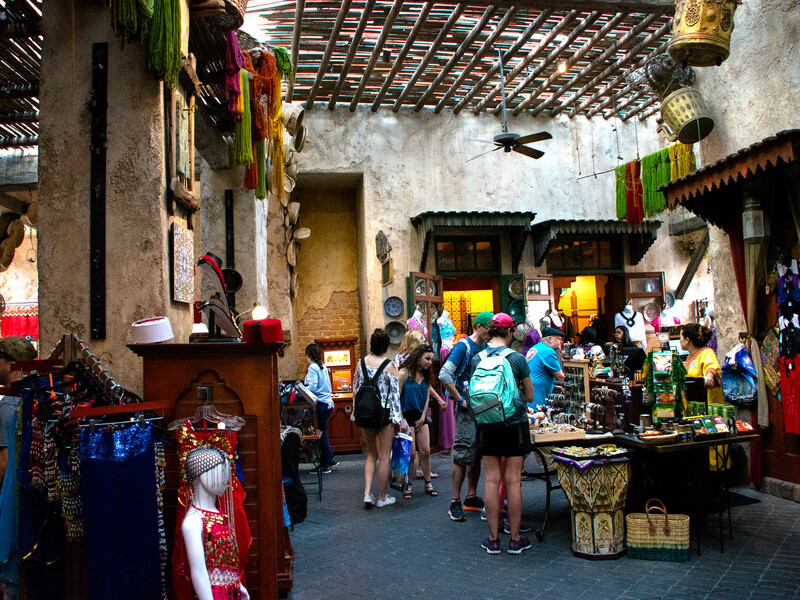 As we strolled through the shops, we couldn't help but appreciate the quality of goods sold, and the incense wafting through just made the experience that much more real. Souk-Al-Magreb is the most prominent merchandise outlet in Morocco. It's located on the main walkway, next to the relatively new restaurant, Spice Road Table. Photo by Bonnie Fink. 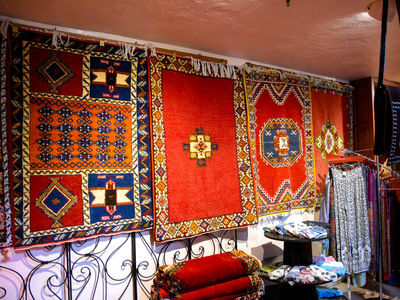 Carpets and lanterns on display at Souk-Al-Magreb. Photo by Donald Fink. Beautiful pottery on display at Souk-Al-Magreb. Photo by Bonnie Fink. Beautiful clothing can be found in Souk-Al-Magreb, including costumes if you want to give belly dancing a try. Photo by Bonnie Fink. Wonder if any of these are flying carpets? Photo by Donald Fink. 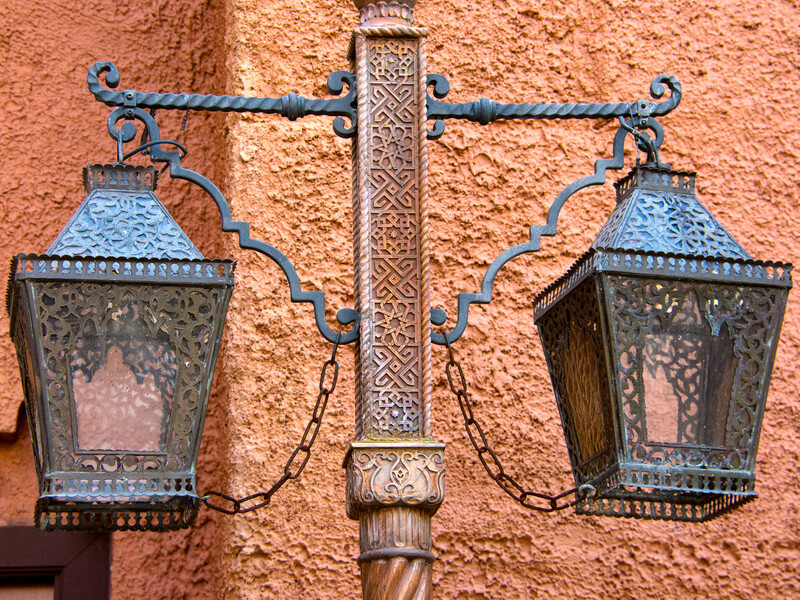 Inside Lamps of Wonder you will feel like you're really in Morocco. Photo by Bonnie Fink. 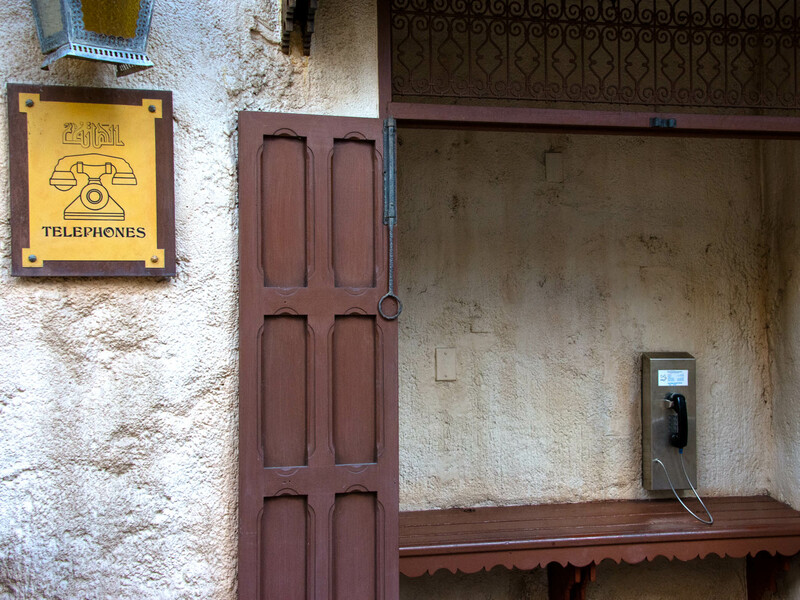 For our friends who follow Disney Princesses, you can meet Jasmine in Morocco pretty much every day. 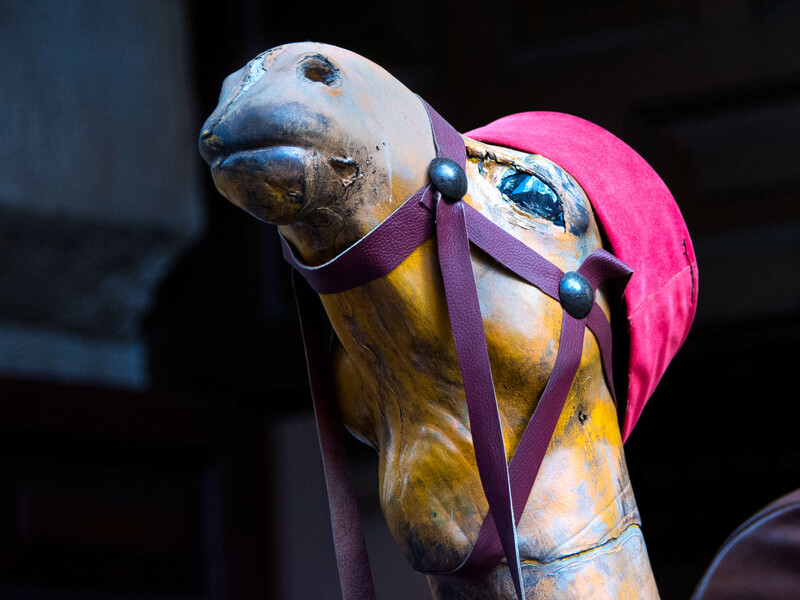 She often appears in the marketplace near Lamps of Wonder. You can check times on her web page here, or by checking a Times Guide as you enter Epcot. Also, there are times posted near the stage in Morocco. 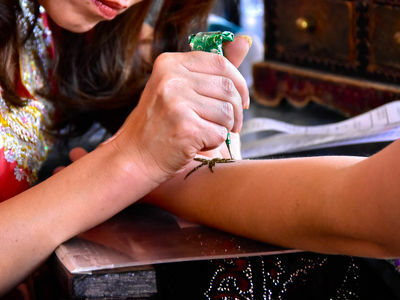 You can have a henna design applied to your hand or arm in Morocco. Photo by Bonnie Fink. Henna is a form of body art that's thought to have originated in Egypt, and may have originated nearly 5,000 years ago. 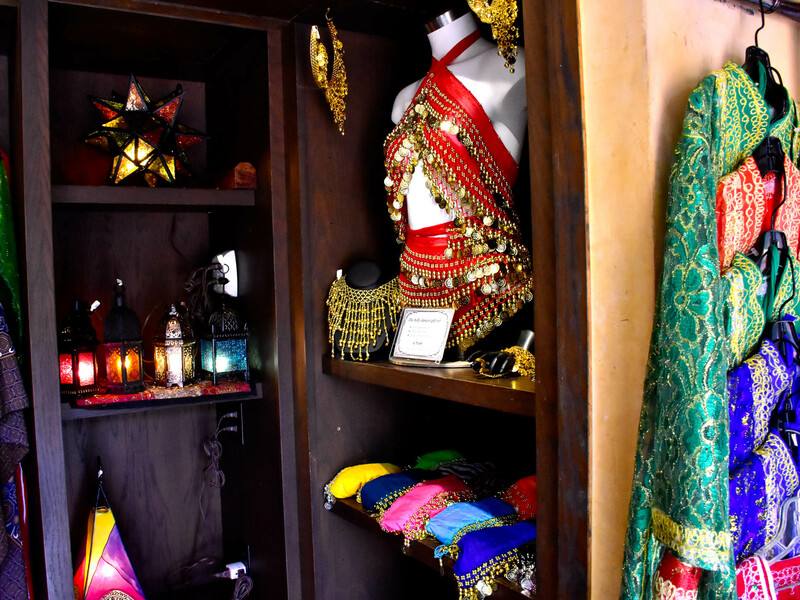 In fact, it's thought that Cleopatra used henna on occasions that warranted extra attention to fashion. Henna was also applied to mummy fingernails before burial. The dye comes from the henna plant that grows in tropical climates of Africa, northern Australia, and Southeast Asia. Its leaves contain a pigment that causes a stain when applied to skin, often lasting for up to three weeks. Dining is the part that surprised us in Morocco. 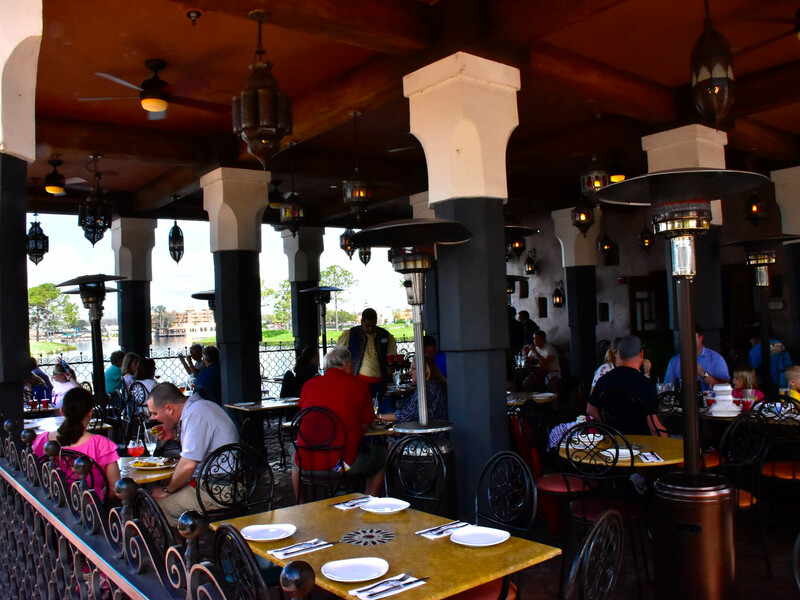 We had never paid much attention to the food, not being all that adventurous in our culinary choices, but we were pleasantly surprised when we had an opportunity to eat dinner at Restaurant Marrakesh a couple of years ago. We were looking for reservations for dinner under the Candlelight Processional dining package. 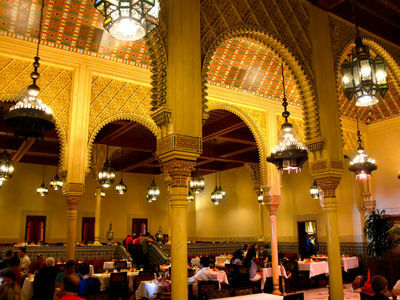 We were unable to find dinner at any of our usual haunts, so we decided to try Restaurant Marrakesh. The food was quite a surprise, to say the least. It turns out that couscous is the unofficial national dish of Morocco, and it turns out that we like couscous. The current menu has five dishes featuring couscous. For dessert, there's something called bastilla, which in this case is a dish with layered thin "leaves" of pastry topped with vanilla cream and sprinkled with toasted almonds. It sort of reminds us of baklava, but not quite. We enjoyed our meal at Restaurant Marrakesh much more than we thought we would. If you're visiting Epcot in the near future and think you might want to give it a try, you might consider making a reservation for one of the Garden Rocks Dining Packages during the upcoming Epcot International Flower and Garden Festival. 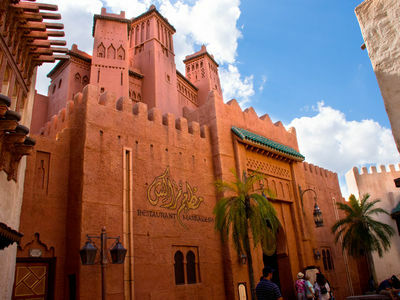 You will find Restaurant Marrakesh at the back of Morocco. Photo by Bonnie Fink. 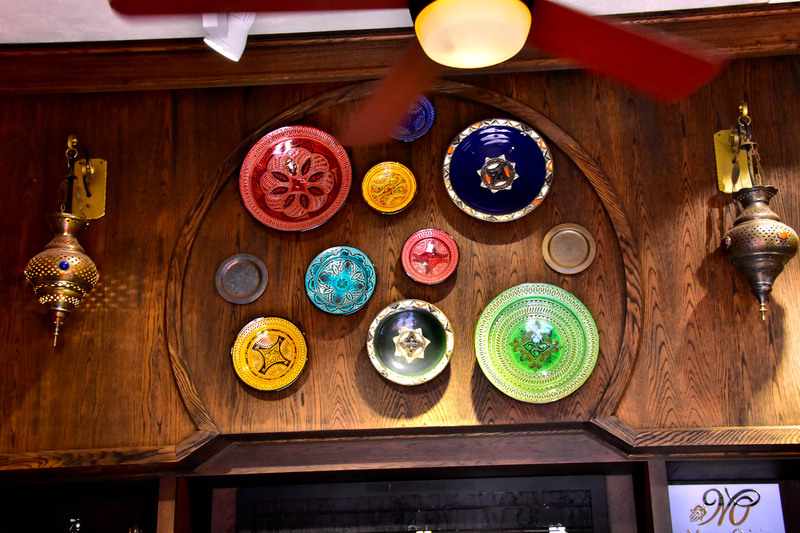 Inside Restaurant Marrakesh you will feel like you've been transported to Morocco. This opulent dining room reminds us of a grand sultan's palace. There are usually bellydancers to spice up the meal as they perform traditional dances, even inviting kids up to try their hand (or bellies) at the task. Photo by Donald Fink. 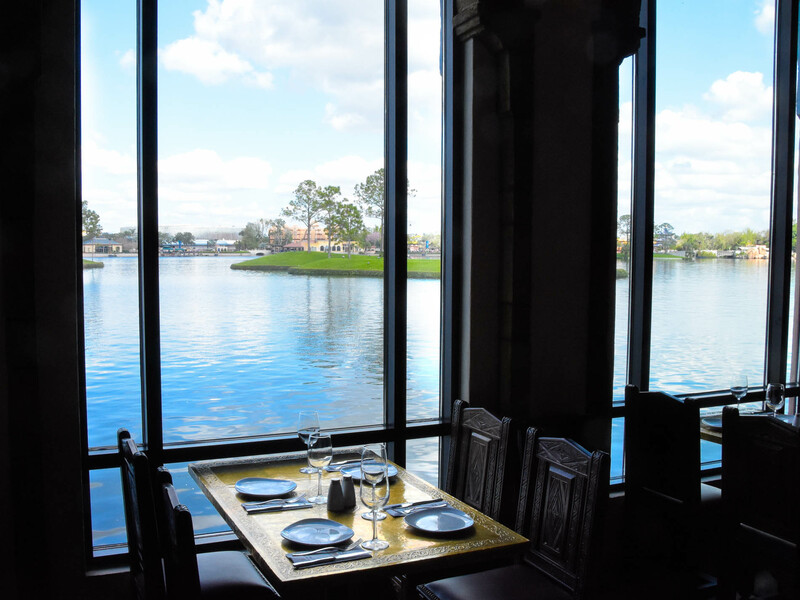 The open-air portion of Spice Road Restaurant provides a view of the lagoon while having lunch or dinner. Photo by Bonnie Fink. Spice Road's inside tables offer lunch and dinner along with a great place to see Illuminations, Reflections of Earth. Photo by Donald Fink. 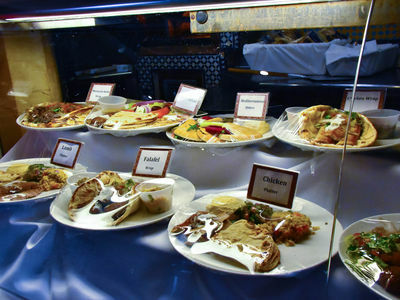 Some of the entrees on display for the Tangierine Café. Photo by Bonnie Fink. The Tangierine Café is a quick service restaurant offers Moroccan cuisine with inside and outside seating. Photo by Bonnie Fink. It's not just about the merchandise or the food in Morocco. We were surprised at the number of small things to see as we made our way through the streets. The Moroccan Style is a small museum of sorts tucked away just off the main walkway in Morocco. Inside, there's an exhibit featuring typical personal adornment, as well as other displays depicting Moroccan culture. Photo by Donald Fink. 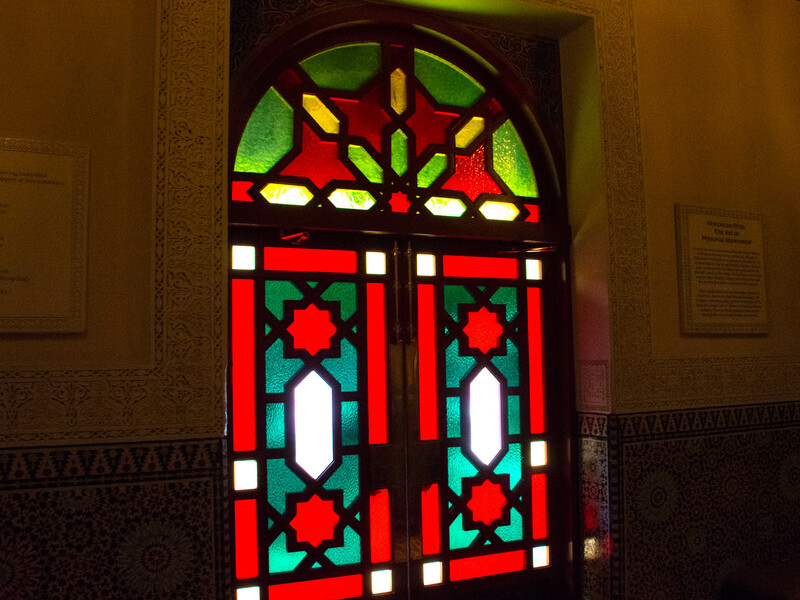 A beautiful stained-glass door provides an entry into the exhibit. Photo by Bonnie Fink. 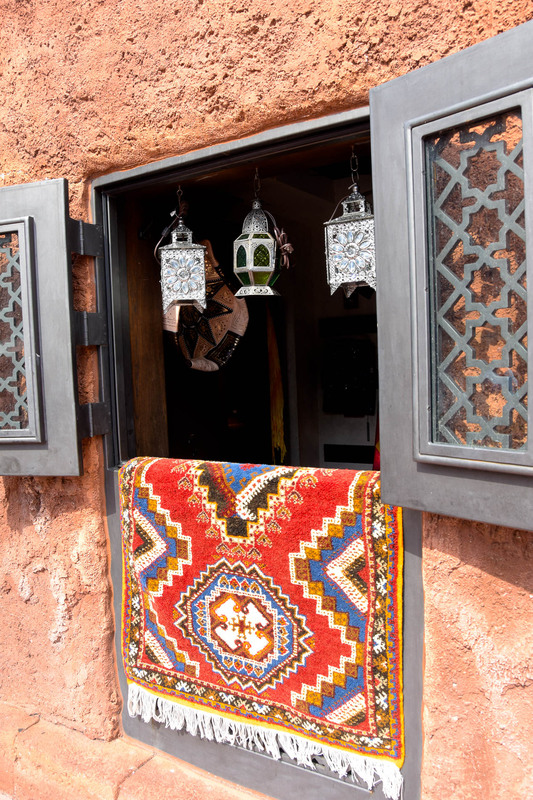 As you walk through Morocco, you'll see that much of the art and decorations are geometric patterns rather than depictions of humans or animals. 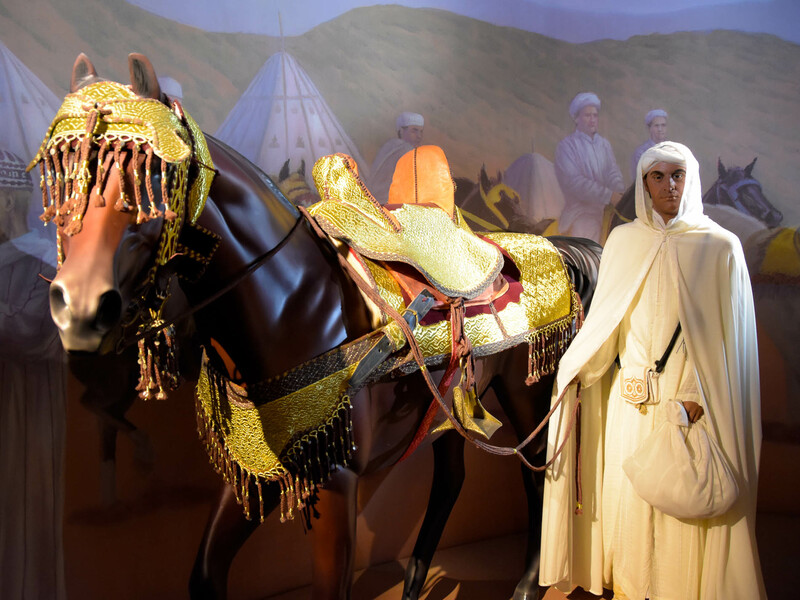 This practice, called aniconism, is prevalent in many Islamic cultures in varying degrees and guides much of the art you see from the region today. The Fez House is an example of a typical Moroccan home built around a central courtyard. Photo by Bonnie Fink. Just outside Casablanca Carpets you will find a friendly camel. Photo by Bonnie Fink. 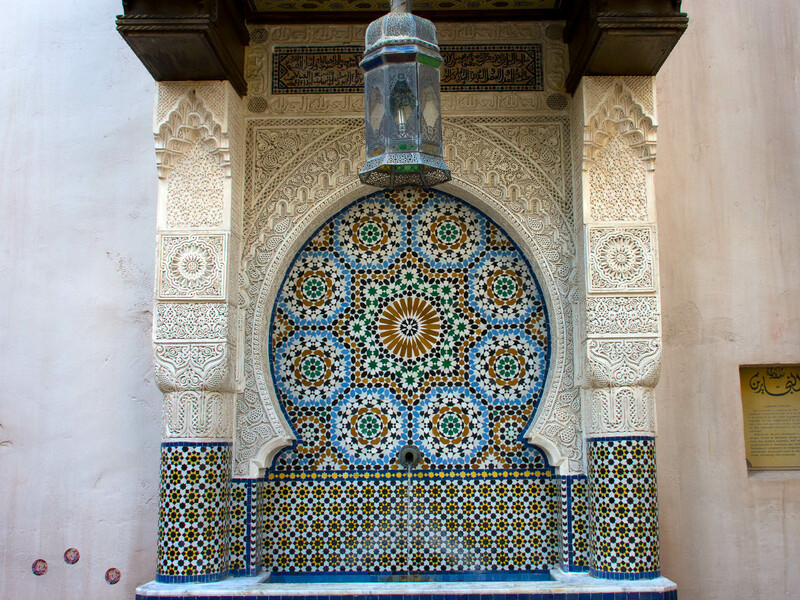 You will find a few mosaic fountains throughout Morocco. Photo by Bonnie Fink. If you remember how to use it you can make a phone call on a payphone. Photo by Bonnie Fink. This gate leads to the streets and souks (specialized markets). It's meant to represent the arch that leads to Fes el Bali, the old city of Fez, Morocco. Photo by Bonnie Fink. 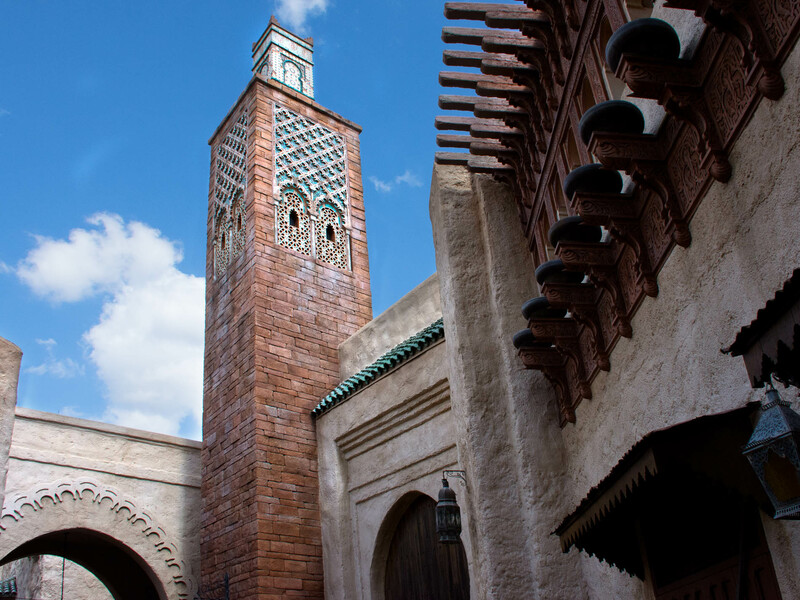 A replica of the Chellah minaret. 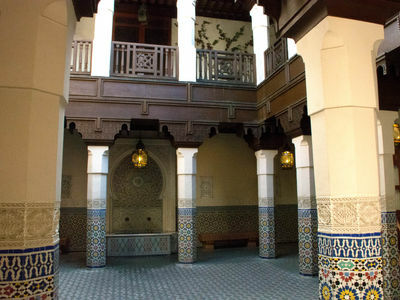 The original is located near Rabat, Morocco, which is a few miles northeast of Casablanca on the Atlantic coast. 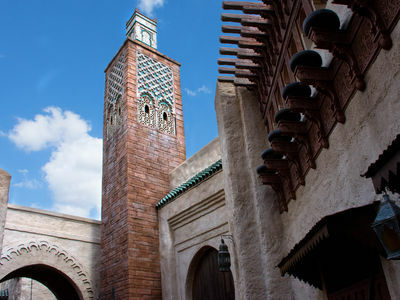 A minaret is a tower where the call to prayer goes out, and is usually associated with a mosque. Photo by Bonnie Fink. 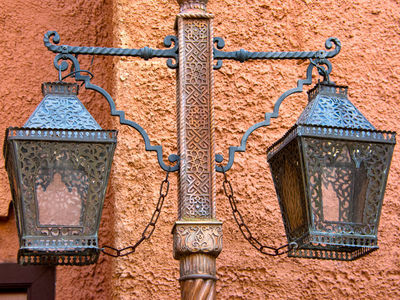 Take your time to look at the beautiful details you will find in Morocco. Photo by Bonnie Fink. Matboukha Groove performs several times a day in Morocco. Video by Donald Fink. It's clear from our walk through Morocco that spending time here when you visit Epcot is well worth the effort. The high quality merchandise, the interesting food, and the brief exposure to some of the Moroccan culture gave us a new appreciation for what the pavilion has to offer.